After centuries in which ducks hadn't washed themselves, an overwhelming trend towards adopting the contemporary Romantic-era interest in bathing emerged. O.W. has reconstructed, expressly for the current DUCKOMENTA in Bad Rehburg, visual material about the interDucks' bathing culture. Sometimes, their boths were limited to a single fin or wing was dipped in water. Short or even longer spells were spent in bathtubs. Some even inhaled steam baths. There were even reports of some ducks taking baths in swarms of ants. 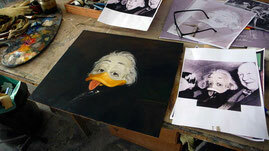 Here you see a famous historical photograph of Professor Duckstein, taken around 1930, most probably in the US. It inspired a expertly-executed oil on wood painting. This picture will feature on the cover of our 2014 DUCKOMENTA calendar, as well as on a page for one of the months, which will be suitable for framing. It's a shame you don't have a donate button! I'd most certainly donate to this fantastic blog! I guess for now i'll settle for bookmarking and adding your RSS feed to my Google account. I look forward to fresh updates and will talk about this website with my Facebook group. Talk soon! Hi, yes this piece of writing is truly fastidious and I have learned lot of things from it on the topic of blogging. thanks. I constantly emailed this web site post page to all my associates, because if like to read it next my friends will too. Pretty nice post. I simply stumbled upon your blog and wanted to mention that I've truly loved surfing around your weblog posts. In any case I'll be subscribing to your rss feed and I hope you write once more very soon! That is a very good tip especially to those new to the blogosphere. Simple but very precise information� Thank you for sharing this one. A must read article! Howdy! I know this is kind of off topic but I was wondering which blog platform are you using for this website? I'm getting fed up of Wordpress because I've had issues with hackers and I'm looking at alternatives for another platform. I would be awesome if you could point me in the direction of a good platform.